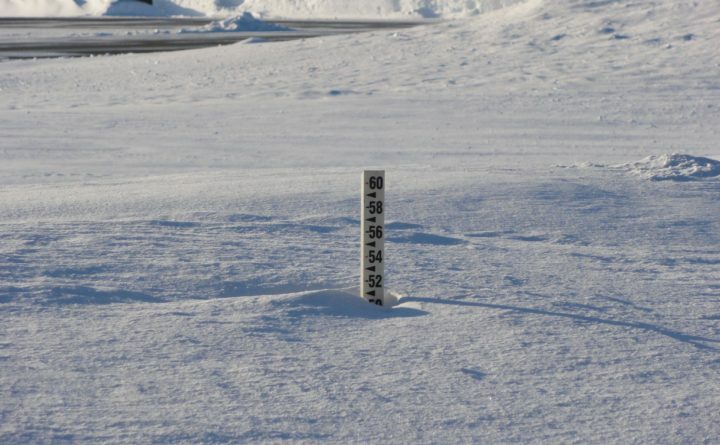 One of the four snow stakes at the National Weather Service in Caribou was at 51 inches on Friday. Caribou saw another 10 inches of snow from a winter storm on Sunday. A winter storm brought a foot of snow to some parts of Aroostook County on Sunday along with significant wind. That wind also is going to factor into Tuesday and Wednesday with dangerously cold wind chills are expected. The blowing snow also was causing multiple traffic incidents and issues for motorists in The County. In Presque Isle, public safety agencies responded to a handful of minor traffic incidents over the course of the storm, Presque Isle Police Chief Laurie Kelly said. Around 7 a.m. Monday, Presque Isle police and the Maine State Police were on the scene of Route 1 near the entrance to the University of Maine at Presque Isle, where a tractor-trailer was struggling to ascend a hill. Kelly said that Cowett’s Auto was called in and assisted the truck in getting up the hill. The Caribou Police Department also handled three motor vehicle crashes Monday morning, including one near the County Stove Shop on the Presque Isle Road. As of 10 a.m., officers were still responding to crashes, so no additional information was immediately available. Tim Duda, meteorologist at the National Weather Service in Caribou, said Monday that northern Maine received the most snow in the state from the storm. Fort Kent and Madawaska both picked up 12 inches of snow. Caribou recorded 10 inches, while 9 inches fell in Presque Isle and 8 inches in Fort Fairfield. Duda said that accumulations diminished going south. Lamoine received 3.7 inches of snow, while Bangor recorded only an inch. So far, Caribou has received 143.6 inches of snow since last October, which is 84.5 inches higher than the normal amount of 59.1 inches over the same period. Duda said it still is unlikely that this winter’s snowfall totals will surpass the record 197.6 inches that fell during the winter of 2007-2008. The second snowiest winter was in 1954-1955, when 181.1 inches fell, while the third snowiest winter was in 1981-1982, when 159.9 inches was recorded. Forecasters also warned Monday of extremely cold wind chills expected on Tuesday and Wednesday mornings. Clayton Lake is expected to see temperatures of 36 below zero, while Caribou could see temperatures of 35 degrees below zero. Presque Isle is expected to get as low as 34 degrees below zero, while Houlton is expected to see a temperature of 29 below zero.